An unexpected outcome in the UK General Election has seen the Pound fall sharply against a host of major currencies. Pound Sterling Live's ongoing coverage suggests the currency will remain susceptible to further losses. BUT - should the prospect of a softer Brexit emerge it could go higher. Volatility is likely which is problematic for those with large-scale international payments looming. Our partners at RationalFX aim to mitigate this risk. Get in touch with a RationalFX foreign exchange market trader who will assit you in planning for the upcoming uncertainty. 3) Set a limit to which you are not willing to go below. Why RationalFX Deliver Up to 5% More Currency on GBP to EUR Transfers. Those with future euro requirements should consider locking-in the current strong GBP-EUR exchange rate. The pound is at its strongest levels since 2007 but as we note here, could be due a correction in coming weeks. RationalFX offer their clients something known as a Forward Contract. Here you lock in an exchange rate that will be utilised at a later date when you finally execute your transfer or payment. This automatically takes away uncertainty from the equation, allowing you to budget accordingly. A forward contract can be entered to up to 2 years in advance, a 10 pct deposit is required, the remainder is due when your contract matures. Please use the SSL secured form to your right to get in touch with a dealer. Send your foreign exchange question direct to an international payments currency specialist at RationalFX Premier. Perhaps more important than getting the best exchange rate is the need to get your timing right on cross-border payment transactions. 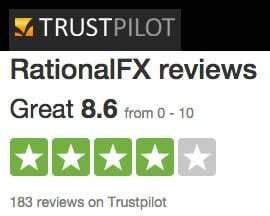 The team at RationalFX Premier are more than happy to give you their views on the currency markets and suggest how you should position yourself for that all-important payment. Please note this service is not open to speculative forex traders but to those who have real-money decisions to make. Enquire about hedging your risks by locking in today's rate for future use, or setting a limit to the level you do not wish to see the rate fall. I need to make an international payment to a university in Poland in Euro (11,000) can you help and how much total it will cost? I have a house deposit in sterling for a property in euros which I wish I'd changed last week. How long do you think this rally will last i need around 10000 in next few days and 70000 in the next few months, what do you suggest? Should I convert British Pounds to US Dollars now or wait a few weeks? What is the projection for the mid June time frame? Is it a good time to move sterling to Canadian bank account? I am holding out for 2.2 and have a year to wait, so no rush and should capture the BoE increase/s this end, plus a bit more from the RBA on the fundamentals side.. China continues to support the theory also I feel.. I see this as "achievable", but don't see anything much higher realistically going forward.. The lofty nights of over 2.3 are perhaps gone now. Is this a view shared? Be smart, don't leave FX purchases and sales to chance. Work with a dedicated FX broker who can offer advice on how to best protect your money while taking full advantage when exchange rates move in your favour. RationalFX have access to almost 50 different currencies and can transfer funds to and from over 150 countries around the world. The ability to speak to a personal account manager with expertise in FX. Understand the consequences of currency fluctuations. Ask your trader to monitor the rates during invoice periods to try and help you buy currency when the rates are favourable. Be aware of the products and services available to you and implement the best-fit strategy. Guard against unfavourable rates and additional charges. Authorised by the Financial Conduct Authority (FCA), FRN No: 507958 for the provision of payment services. As such all clients' funds held separate from RationalFX funds in a segregated client account at Barclays Bank. Trusted - To date £1.25Bn (€1.5Bn, $2Bn) worth of currency transferred. I was pleased with the rate I was given, I will be moving some more funds in the near future and will certainly be using RationalFX again. Your after service and the way you kept me informed every step of the way is second to none. Most people only send emails to complain about things never about the great service they have received. Thanks." Sent by private client Ian to RationalFX client manager Louisa Ballard, December 2012. Our strength lies in the vast knowledge and expertise of our foreign exchange dealers, who look forward to discussing your currency requirements and formulating the best FX strategy to help you avoid fluctuations in the FX market. - Paresh Davdra, Sales Director at RationalFX.